Whenever we hear the phrase “health benefits,” the effigy of running and jumping appears to us. As a result, we become afraid of those boring workouts and only in our dream we get ourselves in good shape. Now, it’s widely regarded that playing basketball is the most striking way to burn fat and stay in shape. It’s very effective to improve your health and fitness as it involves all of your body parts. Whether you take it as a competitive sport or play it regularly as a casual backyard game, you’ll get lots of surprising health benefits in playing basketball and followings are the major ones. The most striking part of playing this sport is that nobody is either too old or too young to play basketball and you can easily enjoy it even with only one of your friends though official games require ten players. However, these are the leading benefits to keep you playing this fantastic sport for years to come. Very often we visit a doctor to check up our blood pressure and blood sugar level. However, we never realize the necessity of checking our bone strength in our early age though excessive bone loss can lead us to osteoporosis. However, playing basketball can improve your bone density and bone strength. Exercises like frog jump, running including some other workouts are beneficial to form new bone tissue and thus strengthen our bone. Fortunately, the game of basketball employs all of those workouts. You’ll have to run and jump in this game to score more than your opponents. That’s how this striking game improves our bone strength. Do you know that a lot of overweight people started playing basketball last year to lose their weight? Actually, weight loss workouts are so boring to the fat people and these are also too laborious for them. So, most of them fail to keep their workouts continue. However, basketball is completely different from those fat burning exercises. Fast paced literal movements, running back and forth, restless vertical jump like rope skipping, you’ll get all of these highly effective aerobic workouts in the game of basketball. But, unlike any other exercises, this game is full of excitement. That’s why playing basketball is very effective to burn fat. I have never seen any pro basketball player with unwanted fat in their body. If you minutely observe the game of basketball, you’ll get that basketball is a high-level endurance training or cross-training activity to improve your swimming, running or cycling skills. If you play basketball at least for 60 minutes a day and keep this routine unchanged for 3 months, after three months, you’ll notice that you can now run considerably so much longer than the past without being tired. Almost every morning, I play basketball to boost my endurance. You can try it. Another great health benefit of basketball is that it’s beneficial to improve cardiovascular health. As you know, cardio fitness is very important to lead a disease-free happy life, so, you also may know some cardio workout and their utility. Now, consider having a look at this fantastic game. Definitely, you’ll get that basketball is full of dribbling, passing, jumping, running, fast turning and throwing which function no less than any cardio workouts to ensure a sound cardio health for the players. So, if you want a strong cardio system and don’t have enough time to hit the gym or fitness club, then you can start playing basketball. Who doesn’t want to be confident enough to lead their life in a better manner? Now, you’ll be happy to know that one of the best benefits of playing this most popular team sport is that it can increase your confidence level. The only aim of a basketball player is to score higher than their defenders and to make a score. They shoot the ball over and over again. Repetition of the same thing boosts their confidence and they can basket the ball as many times as they need. This happens because all the basketball players make thousands of shots in their practice session to make it sure that their shots will be accurate in the real games. Maybe it will be impossible for you to basket a ball at your first shot. However, if you start trying it today, and try to shoot the ball hundred times a day, trust me, within seven days, you’ll see that you can make lots of successful shots. This is how playing basketball can boost your confidence. Did you ever think that what actually do we need to lead a happy life? If I’m not wrong, the answer is “sound health” as there’s a wise saying that – “Health is Wealth”. Moreover, to ensure the sound health, we need healthy bones, fat-free body, adequate endurance, strong cardio, and rock solid confidence level to fight against any diseases. 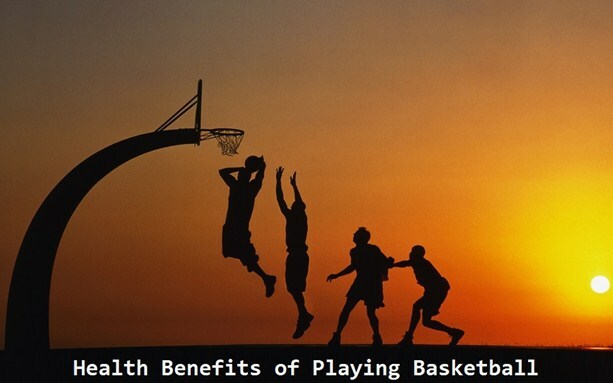 Surprisingly, playing basketball offers all of these health benefits. The game of basketball is played between 2 teams each with five players. The official game is executed under some rules. You’ll come to know about the basketball rules here. However, you can also play this game with just one of your friends or family members. You even can start playing basketball alone with a view to get into great shape. Whether you play alone or along with your friends, you’ll need the following equipment to enjoy this game. First of all, you’ll have to create a basketball court. You can easily create a suitable court in your driveway or your game room. You can watch YouTube videos to create a perfect basketball court. Next to that, you’ll need to buy a basketball, basketball hoop and a pair of basketball shoes. After arranging all these equipment, invite your friends to your court and start playing your first basketball match. To ensure the sound health, anyone of any age can take this sport as a part of their fitness workout routine. But, those who are overweight, they should visit their doctor before start playing basketball. The best part of this sport is that it can be played both indoor and outdoor. Wherever you play this game, if you play it regularly, you’ll experience all of those health benefits. Amazing!Basketball is all time favorite of my kids and family. I am glad to know about the benefits of play basketball.It’s inspired to play more basketball. Thanks for sharing such a nice blog.